Earlier in the week homebuilding stocks reveled in news that median new home prices rose to a multi-year high, overlooking the apparent slide in accompanying demand. As the week draws to a close homebuilders are underperforming the market with shares in the SPDR S&P Homebuilders ETF down by 1.9% to $31.12 while the broader S&P 500 (CME:SPM14) index is lower by 0.65%. Shares in the ETF are now within 1.4% of this month’s low at $30.66, which is the lowest price since mid-February. The late-in-the-week slide has perhaps prompted one investor to place an options combination that would benefit from further weakness in the performance of the stock. Using further-dated January 2015 derivatives, the investor bought 2,000 put options with a strike price of 30.0 and sold call options with a strike price of 34.00. The long put option position should appreciate should shares decline, while the cost of entering the trade is reduced by writing call options, which the investor predicts will wither should the construction sector weaken. The nine-month put options cost 1.92 per contract, but the total premium was reduced to 1.22 by selling the away-from-the-money calls at 1.22. The cost of downside positioning thereby is reduced to 70-cents per contract. 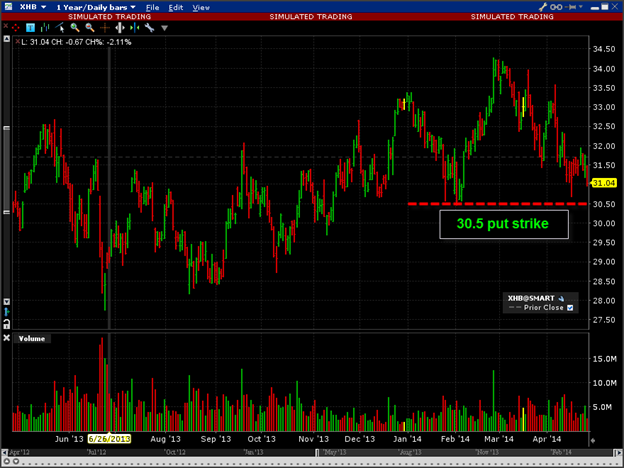 The trade starts making money below the effective breakeven price of $29.30. The price of XHB shares would need to rally at least 9.0% over the current price of $31.12 in order for the trade to lose money over and above the 70-cents paid to establish the spread at expiration.